As a member of the Repair Cafe in Maastricht, [Bertoa] sometimes needs to take a few tools out into the field to repair mechanical and electronic devices. His previous solution to the problem was a toolbox in the trunk of his car, but he knew he could come up with a more environmentally friendly solution. He created a portable workbench that fits right on his bike rack that is able to transport all the tools needed for light repairs using only a bike. [Bertoa]’s portable workbench is made up of two parts; each side has one small slide drawer perfect for storing screwdrivers and wrenches, as well as a second tilting drawer able to hold heavier items such as an electric drill. The work surface joins the two sides of the workbench together and is able to fold out with the help of a piano hinge and a few brackets. The workbench is removable from the bike rack and is able to stand on its own (stowable) legs made of aluminum tubes. Even though the portable workbench only weighs about 10kg, it’s able to support [Bertoa]’s full body weight; a wonderful addition to any maker’s bicycle and a great solution to working on projects in the field. I was thinking about building a portable electronic lab in a suitcase i can attach to the luggage rack of my bike. This goes much further with the addition of a full workshop table. This is very fine craftsmanship, if I lived him in Maastricht I’ed hire him. If he had an E-Bike he could use the battery for a source of portable power to run some power tools. 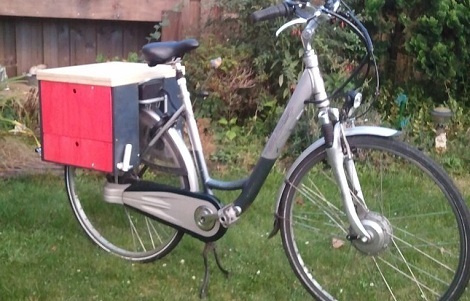 Just get a “bakfiets” (dutch term, i seriously doubt there is an english term). You can stuff you whole workbench in it and cycle to where you need to be. Best i’ve seen, i’d like one for hauling fishing supplies or picnic supplies. Always wanted to fish from a set up table rather than reach for tackle off the ground all the time. i could also see a bit of tweaking for car/van travel and tailgating and again, fishing supplies…so cool.